You Are Here: Home » National News » Do You Know Mae Jemison? 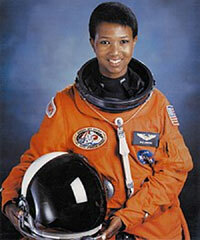 Do You Know Mae Jemison? The world’s first female Black astronaut was a luminary in her time. She enrolled at Stanford University at the tender age of 16! Jemison graduated from Stanford in 1977, receiving a B.S. in chemical engineering and fulfilling the requirements for a B.A. in African and Afro-American Studies. She became the first African American woman to travel in space when she went into orbit aboard the Space Shuttle Endeavour on September 12, 1992. Dr. Jemison has said that majoring in engineering as a Black woman was difficult because race was always an issue in the United States. “Some professors would just pretend I wasn’t there. I would ask a question and a professor would act as if it was just so Jemison said that majoring in engineering has a Black female was met with immense resistance. I could ask a question in lecture and the professor would ignore me as if I had asked the dumbest question he had ever heard. Then, when a white guy would ask the same question, the professor would say, ‘That’s a very astute observation.’ “ In an interview with the Des Moines Register in 2008 Jemison said that it was difficult to go to Stanford at 16, but thinks her youthful arrogance may have helped her. ”I did have to say, ‘I’m going to do this and I don’t give a crap (damn).” This is just one example of the hurdles so many of our Black icons have had to overcome.